LONDON/DUBAI (Jan 31): OPEC's oil output is set to fall by more than 1 million barrels per day (bpd) this month, a Reuters survey found on Tuesday, pointing to a strong start by the exporter group in implementing its first supply cut deal in eight years. The Organization of the Petroleum Exporting Countries agreed to cut its output by about 1.2 million bpd from Jan 1 to prop up oil prices and reduce a supply glut. Supply from the 11 OPEC members with production targets under the deal has averaged 30.01 million bpd, according to the survey based on shipping data and information from industry sources, down from 31.17 million bpd in December. Compared with the levels that the countries agreed to make the reductions from — in most cases their October output — OPEC members have cut production by 958,000 bpd of the pledged 1.164 million bpd, equating to 82% compliance. Compliance of 80% comfortably exceeds the initial 60% achieved when the previous cuts deal was implemented in 2009, and the survey adds to indications that adherence so far has been high. "This is very high, a good number," an OPEC source said of the January compliance estimate. "I hope it continues." Oil edged above US$55 a barrel on Tuesday. The cuts agreed by OPEC, Russia and other independent producers has helped to lift prices from a 12-year low near US$27 a year ago. The January drop in OPEC output has been offset slightly by higher supply from Libya and Nigeria, which are both exempt from the OPEC agreement because of output losses caused by conflict. Saudi Arabia has reduced output to less than 10 million bpd in January, industry sources told Reuters, implementing a bigger cut than it had agreed to set a good example on compliance. Iran, which was allowed to raise output under the OPEC deal because sanctions had crimped past supply, pumped an additional 20,000 bpd. 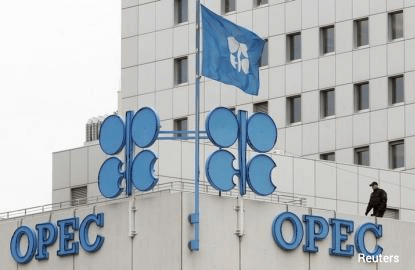 OPEC announced a production target of 32.5 million bpd at its Nov 30 meeting, which was based on low figures for Libya and Nigeria and included Indonesia, which has since left the group. Combined output in January from all members is about 520,000 bpd above the target, adjusted to remove Indonesia, the survey showed. The Reuters survey is based on shipping data provided by external sources, Thomson Reuters flows data and information provided by sources at oil companies, OPEC and consulting firms.